Over 100 years ago, Little Italy was a neighborhood spread out for over a dozen blocks, stuffed to the brim with Italian immigrant families who lived and worked there to achieve the American dream. But today its size has shrunk from a heaping plate of spaghetti to a mere forkful. The neighborhood stretches only about four blocks, which are filled with tourist shops and restaurants pushing “the best homemade” cannolis and meatballs around. What was once a home to thousands of Italian immigrants in New York has become what many call a tourist trap. But though the neighborhood has changed, there are some Italian-Americans who refuse to give up their businesses, homes and the true essence of Little Italy. Many believe that those who remain in the neighborhood are what keep its nostalgia alive. “Little Italy, ain’t only a place, it’s a mind set,” said Ernest Tramontana, a lifetime Little Italy resident. Hasia Diner, professor and academic chair of Hebrew and Judiac Studies at NYU, said that Italians immigrants moving out of the neighborhood was a positive thing for them because it meant they were making it. “Little Italy was really the victim of its own success, in as much as the children and for sure the grandchildren of the people who lived there wanted to live in places with yards, if not the actual suburbs,” Diner said. 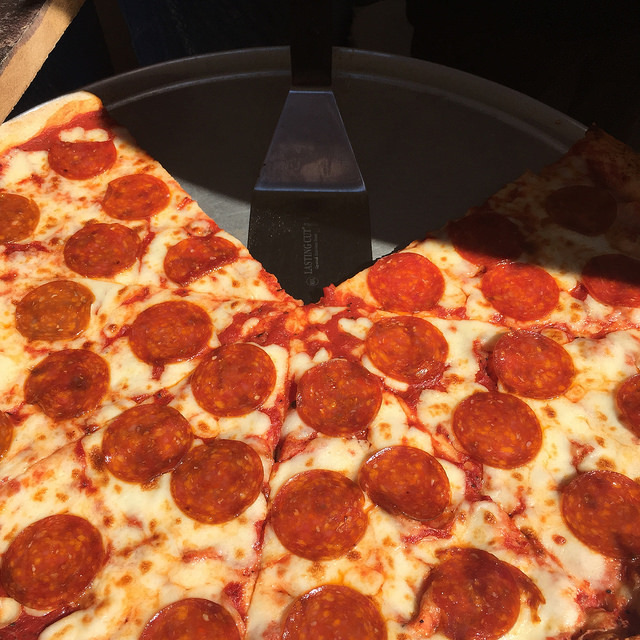 Vinny Vella, a 3rd generation Italian-American, sat at the little patio outside La Bella Café, at a marble topped table scattered about with lottery scratch tickets, laughing and joking with friends while watching passersby on Mulberry Street. “Every week we do this,” he said. “We play and then decide who gets what,” he said pointing at the scratch tickets with a hearty laugh, waving his hand adorned with a gold ring on his pinky and chain on his wrist. On the crisp fall afternoon, Vella was dressed to the nines; his black knee-length peat coat and grey grizzly hair toped off the look. 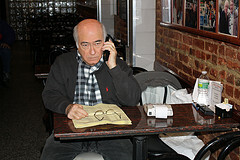 Vella, 63, is an actor who has lived in Little Italy most his life, and prefers to keep it that way. Though he said the area has changed dramatically since he was young, he can’t seem to bring himself to leave. For Vella, Little Italy still possesses charm and romance. Between 1810 and 1980, over 5.3 million Italians immigrated to the U.S., many fleeing poverty and overpopulation, with over 2 million between 1900 and 1910, according to census information. Many of these Italians settled in Little Italy neighborhoods all over the country, the most famous being in New York. Historically, Little Italy in Lower Manhattan ran north to Bleecker Street and south to Canal Street. It stretched west to Lafayette and east to Bowery Street. Today, the neighborhood has shrunk to a few blocks on a single street. Businesses were once stretched out among the large neighborhood. Now what’s left of the neighborhood lies mainly on Mulberry Street from Broome to Canal streets. Meanwhile Chinatown, Little Italy’s touching neighborhood, continues to grow in size and numbers, engulfing areas of Little Italy as Asian immigrants continue to flow into the United States. Stores once owned and run by Italians have been sold to Chinese management. Diner said Chinese immigration was big in the 1960s and still continues to be today. Vella has his own theory on why the neighborhood changed. Back in the 1940s and 50s when many Italians immigrated to New York, they bought up a lot of buildings for a little money, he said. But as time went on and rent increased, many were forced to sell, or wanted to take the money and make a new life. 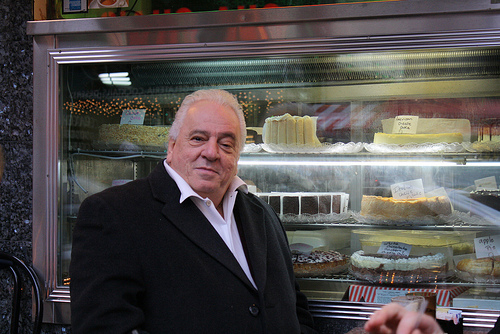 Many Italians left Little Italy, moving to other parts of New York, like Staten Island and Long Island, he said. Vella’s father, Louie, started his own fish market on Mott Street in Little Italy, and ran the business for years before selling. Louie was born in New York, but was taken back to Italy with his parents, who were born in Italy, when he was nine months old. He grew up in Italy and came back to New York at 17. He started working as an ice man, saved money, bought a pushcart to sell fish from and eventually opened his own market. Louie ran the market 41 years before selling. Vella said his father didn’t sell because he needed the money, but because he had to retire. Louie didn’t want to sell the business to anyone but an Italian, Vella said. “I said ‘Pa, there’s no Italians gonna buy this store. It’s all Chinese right now, you have no choice,’ ” he said. Eventually he couldn’t keep it up anymore, Vella said, and his father sold the business to a Chinese family, who still runs the market today. Over the years Vella has watched the neighborhood change. “There are more tourists now then there were before. Canal Street was the borderline. There was Italians on one side of the street and Chinese on the other,” Vella said. While there is no doubt the neighborhood is not the size it once was, others believed it hasn’t really changed all that much. Tramontana, an Italian-American who was raised and still resides in Little Italy, said there are still plenty of Italians living in the area. Tramontana, 30, is president of Sons of Little Italy in New York, an organization dedicated to promoting tradition and culture. He believes the changes the neighborhood has seen are just a natural part of immigration itself. Tramontana himself said he too will eventually move from the neighborhood, because when he has a family, he wants to give them a different life, the yard. Among the Italians who still own space and run businesses in the neighborhood are Italian-American brothers Frank and Nick Angileri. The Angileri brothers have run La Bella Café on Mulberry Street for 41 years. The brothers were both born in Sicily, Italy, and Franky moved to New York by himself at age 17. A few years later his brother Nick came to live in Little Italy as well. Franky Angileri, 68, thinks the neighborhood changed partly because the younger generation of Italians went to school, became educated and moved out of the neighborhood for more comfort and space. With fewer Italians, the neighborhood began to change, he said. “Many years ago, Italian people used to control the neighborhood and make sure no other nationalities came; they wanted to keep it Italian. Unfortunately, those kinda people aren’t around anymore,” Angileri said. Tramontana said that organizations in Little Italy have to step up promotion and public relations to bring the “bridge and tunnel” people back to the neighborhood. “That’s the future of Little Italy, having your locals come back,” he said. There is no way of knowing how long Little Italy will withstand the economic challenges and overflow of other neighborhoods, but some Italians will stay to keep its essence alive. “When they stop making a good lasagna, I’m outta here,” Vella said.